Published Apr 26, 2017 By Julia 33 CommentsThis post may contain affiliate links. This is the best couscous salad I’ve ever had. 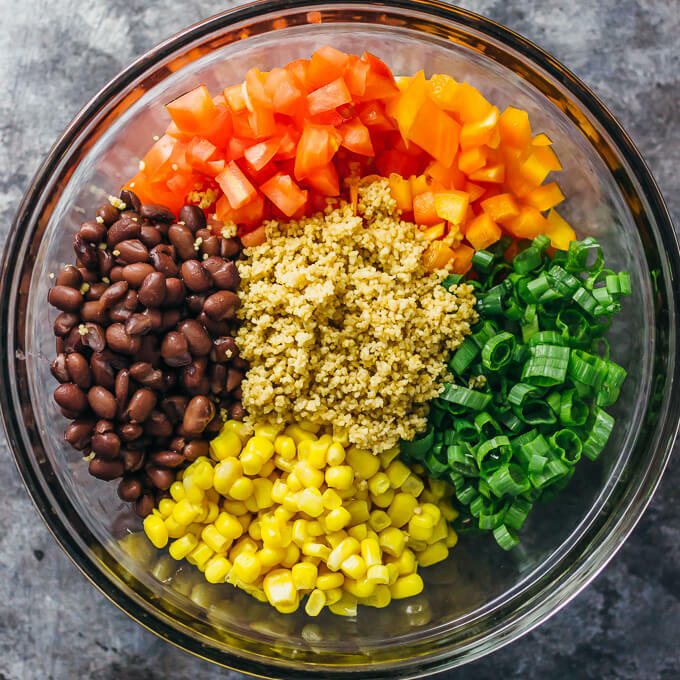 It’s easy to make, vegan, and has a summery southwestern vibe. I’ve been making this summer couscous salad for years. Last time I made this was for a dinner party at my place, and everyone loved the gorgeous colors and the refreshing taste of the salad. 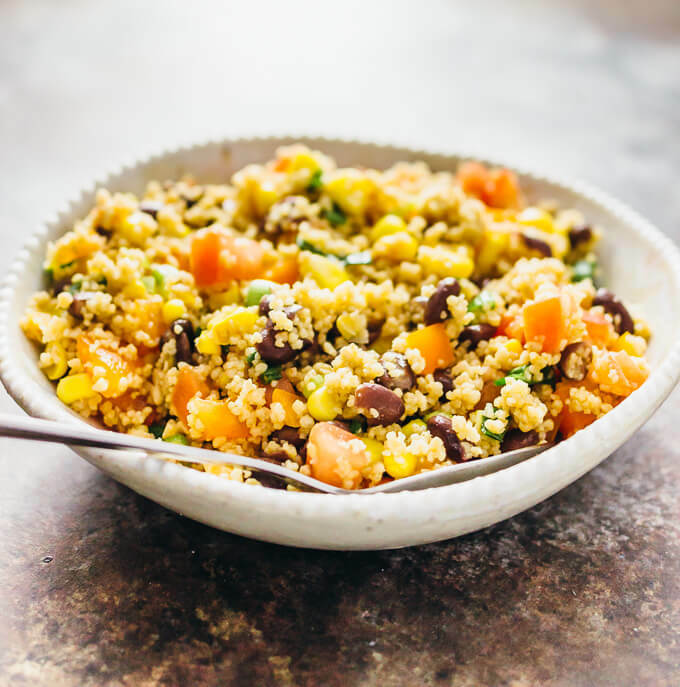 This cold couscous salad is perfect for get-togethers because you can prep all of the ingredients ahead of time and let the salad sit in the refrigerator until ready to serve. 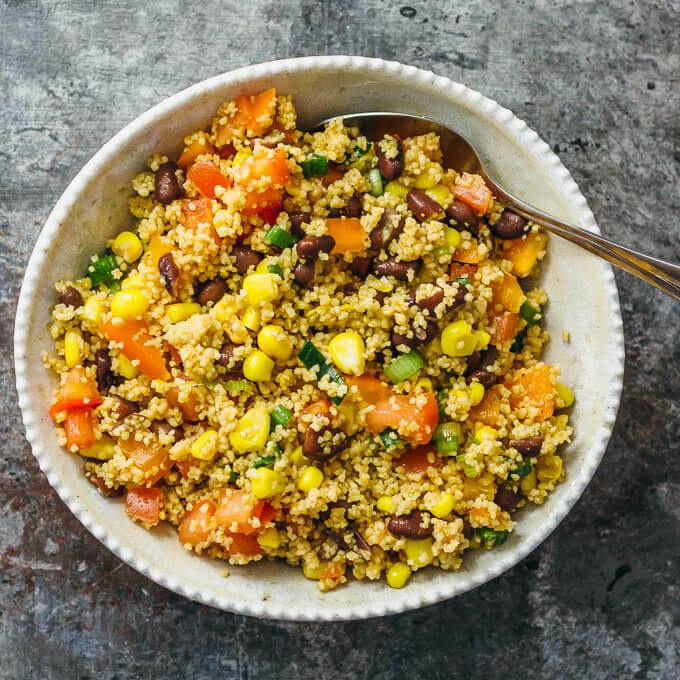 It’s also a simple recipe with just two steps — cooking the couscous in the microwave and tossing the ingredients together — and you can easily scale up to make more servings for a larger crowd. There are a number of ways you can cook couscous. You can cook it on stovetop in a saucepot by letting couscous sit in boiling water for about 5 minutes, or you can microwave for a few minutes. I typically opt for the latter method by microwaving with a pinch of salt and vegetable broth. You should follow the recommended times on the package for your particular type of couscous. After cooking, I immediately fluff the couscous using a fork to prevent it from sticking together. For this recipe, I used whole durum wheat couscous, which is very similar to regular couscous except with the added benefits of whole grain. The couscous salad dressing is simply a mixture of olive oil and fresh lemon juice, with a pinch of salt, garlic powder, and cayenne. Don’t worry about the addition of cayenne if you’re averse to spicy foods — it’s noticeable but barely there, and you won’t break a sweat. If you have leftover couscous from making this dish, there are many ways you can use it up. Couscous is great as a side dish to accompany mains such as Instant Pot salmon, chili-ginger brussels sprouts and beef, and chipotle meatballs. Generally, you can use couscous to replace the role of rice or pasta in any dish, and it goes great with meaty mains. 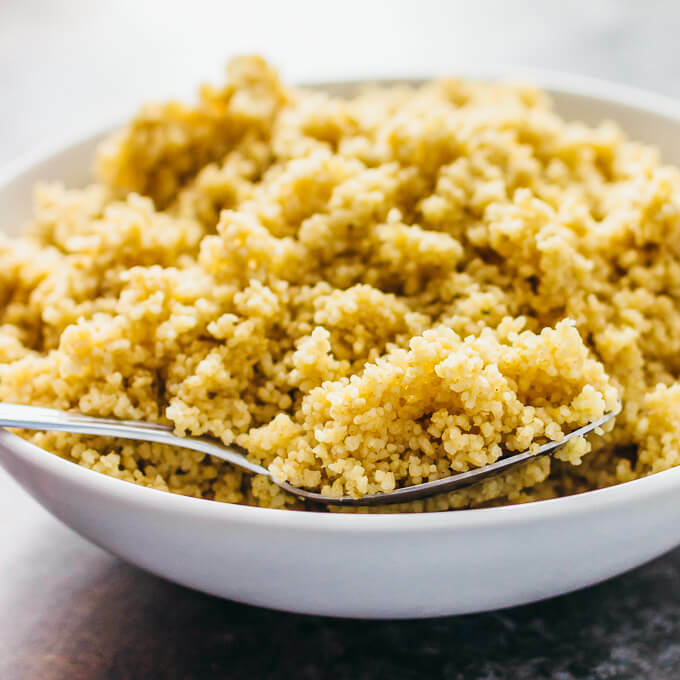 Cooking couscous: Combine all couscous ingredients in a microwave-safe bowl and stir. Microwave for 3 1/2 minutes. Alternately, you can cook couscous according to package directions. Fluff with a fork and set aside to cool. 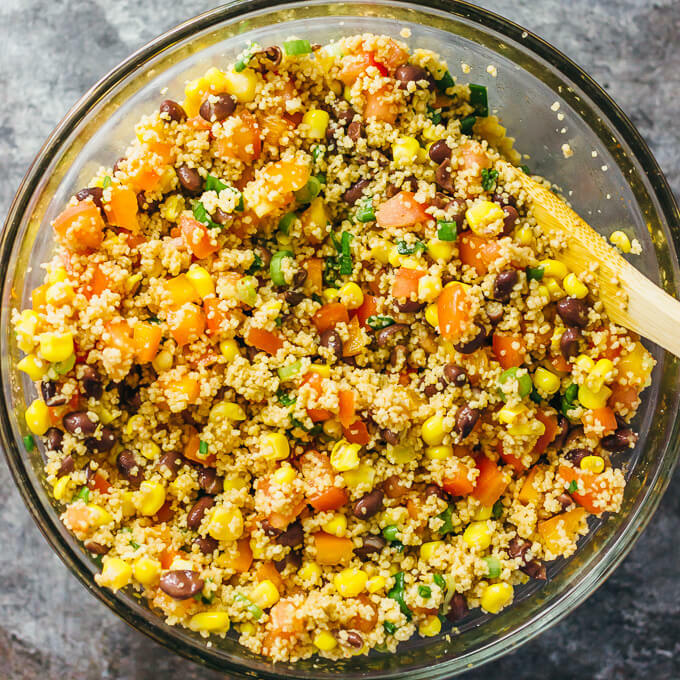 Mix everything together: Combine all of the ingredients, including the cooked couscous, in a large mixing bowl. Mix well and refrigerate until ready to serve. Can I make this today for tomorrow? Yes. Cover and refrigerate. The next day, stir it up a bit before serving. If the couscous looks like it’s sticking together, toss with a bit of olive oil. I have made this twice now in the same month, this time for a potluck, and I LOVE IT!!! I’ve added about 1/3 cup of chopped cilantro (because I love the stuff) and I will make this over and over again this summer. It’s cool and yummy! Thanks so much!! Loved this recipe. I used a can of rotel for the tomatoes and peppers, added mixed veggies in place of the corn, a dash of cumin and lime juice. Hubby says this is a keeper. Served with fresh rainbow trout. This recipe went over super well! I needed to make up a vegan dish that could be enjoyed by all, and this exceeded all expectations. Making it again for my spouse’s office party right now! We use cilantro too! I don’t own a microwave, what should I do to replace that step? Most couscous packages come with instructions on how to cook them — you can follow that if they provide a method that doesn’t involve the microwave. Another method is to use a pot on the stovetop: for 1 cup couscous, boil 1.5 cups water and 1/2 teaspoon salt, add couscous to the boiling water, remove from heat and cover for about 5 minutes to cook. I’m planning on featuring this recipe in a round up of fire-free (cook ahead) Camping Meals on my blog- in.our.pond.com. I’m also planning on making it for our camping trip soon! You’re welcome! Please follow my sharing policy — you can use 1 photo and you need to link back to this post, and I don’t allow the recipe to be republished. I made this for a get together (that is later today) and I doubled the recipe and added cilantro and used lime in place of lemon. It turned out great! Definitely adding this to my permanent recipe book. Hi Drake! I’m happy to hear that you liked the dish 🙂 Cilantro sounds like a delicious addition here. This looks great! Do you have the nutrition information, specifically carb count? Thanks! Thanks Carla! I have calories per serving listed in the recipe above, but not the carb count. To make this lower carb, I would skip the beans. You should be able to find carb information on your couscous packaging. Have u tried this with roasted corn and roasting the bell peppers? I have not, but that sounds delicious!! Let me know if you try it! I’m planning on making it in two days I’ll for sure let you know! Hi there! Looks delicious! Is the calorie count per serving or for the whole batch? Hi Elizabeth! The calories per serving are listed in the recipe above, right above the Ingredients label. Let me know if you have trouble spotting it! I just made this and can’t stop eating it! So good! How long will this last, refrigeratorated? I don’t want to make a batch and not be able to eat it all. Made this for a shower I hosted. It was a hit! Recipe requested by several people. I will definitely be making it again. Nice recipe. It looks beautiful and tasty. But my children don’t like cous cous. What else can be used instead of cous cous? Hi Marisa! You can try quinoa instead of couscous. Just made this for lunch – delicious! Delicious recipe! I’ve made it several times in the past month and am making it again as we speak! Wouldn’t change a thing – it’s perfect as is. Thank you! I made this dish today, and it was beautiful! No need for meat, it is just complete as it is! Would it be easy enough to substitute the cous cous with quinoa? I have several friends that are either gluten intolerant or celiac. Thank you for any info! Hi Wendi! Yes, quinoa would work great as a substitute.